Garter Stitch may be as simple as knitting gets, but what's not always easy for newer knitters is understanding exactly how to count rows and stitches in the stitch pattern. It's actually really easy to count stitches and rows in Garter Stitch once you understand what you're looking at. 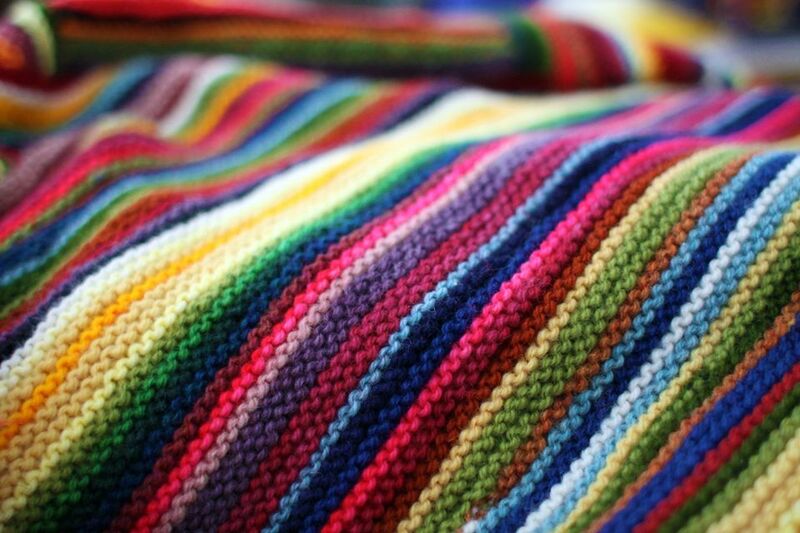 When you look at Garter Stitch fabric you see interconnecting ridges of stitches -- one at the top, the next at the bottom and so on along the ridge. Each "ridge" is actually two rows of knitting. So, for example, in the Garter Stitch sample pictured, there are four ridges of yellow, which is eight rows of knitting. The stitches, then, are the count of either the top or bottom part of a single ridge. You probably can't see it on the small version of this picture, but there are 27 stitches shown in each row. Of course if you're counting whole rows of stitches and your stitches are still on the needle, you can just count the number of loops on the needle to determine how many stitches you have. The only reason you might need to count stitches in the middle of a piece of knitting is if you were measuring a gauge swatch.